Editor's note: this post has been updated. We forgot step 10, set the video saver to 10 minutes and save to a single file. So if you tried and couldn't get this machine to work, we're sorry! Now all the steps are here so we hope you'll try again. Over the weekend record snow fell on the East Coast—more than two feet in many cities! At home in Brooklyn during the storm, Raul built a time lapser with The Everything Machine app to capture all the snow accumulating on the street corner outside his window. At 31 seconds you can see the mayor's motorcade pass. His house is on that street and he took a walk down the block. The cars on the south side of the street stay pretty much snow free because of the wind and a set of grates that keep the sidewalk warm there. The cars on the north side of the street are almost completely covered after snowplows plowed snow off to the right every so often. I'm in this video; can you spot me? Build a time-lapse camera on your device with The Everything Machine app. Download and open The Everything Machine app. Tap the + in the upper right to start a new machine. Connect a toggle to the battery. Connect a camera to the toggle. Connect a second toggle to the other side of the camera. Connect a video player to the camera as well. 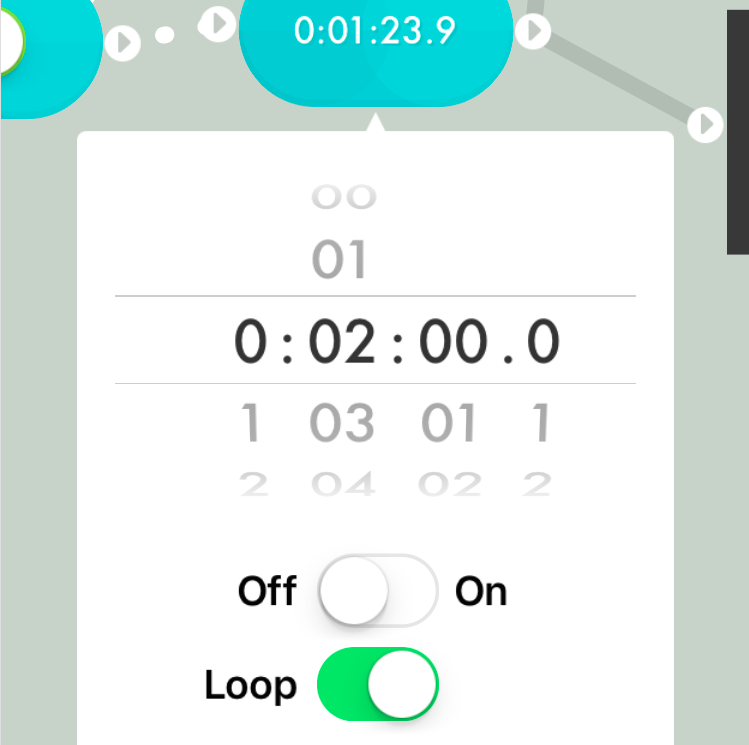 Connect a timer to the second toggle. Set the timer for 2 minutes and turn the loop on (see the image below). 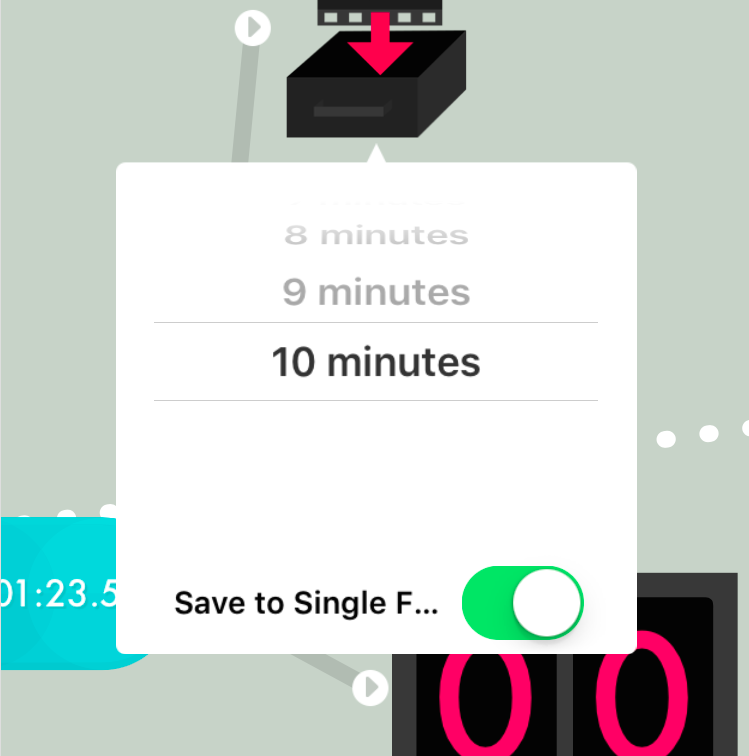 Connect a video saver to the timer to save your timelapse to your device. Set the video saver to 10 minutes and save to a single file (see the image below). Connect a counter to the timer to keep track of how many photos you take. Set your device in front of a window or in your room to capture any action—a storm, what your cat is doing—and switch both toggles on. Your time lapse is in progress! In step 8 above, use these settings on your timer. In step 10 above, use these settings on your video saver. So your device doesn't turn off while the timelapser is running, make sure it's plugged in and turn off Auto-Lock. To turn off Auto-Lock, go to Settings > General > Auto-Lock > Never. Find more machines to try out in The Everything Machine Manual. We'd love to see anything you make! Your inventions will inspire us and others. Please share them! Use #tinybop or @tinybop when posting your photos and videos. If you have any questions, or want to send us your inventions directly, reach out to hi@tinybop.com. 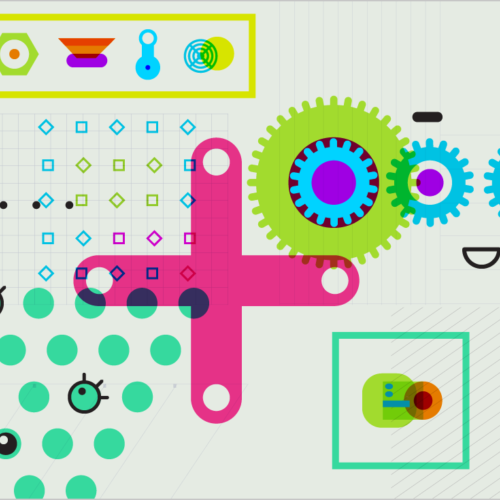 We’re getting ready to release the first app in our second series: Digital Toys. While we’re bringing it into the world after releasing three apps in the Explorer’s Library, Digital Toys was the first series we sketched out and we're really excited about it.